Friday 26 Apr - Latest - Check the listings below for the latest stock availability. 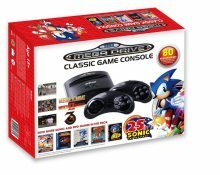 The Sega Mega Drive Classic Game Console (25th Anniversary Edition) has been in short supply since launch in 2016, however we constantly track for stock to ensure you will be the first to know when availability is found. We constantly check for Sega Mega Drive Classic Game Console stock, so you don't have to. Receive email alerts when Sega Mega Drive Classic Game Console online stock is found.